Skilled communicators are often avid readers, so I’ll assume you’ve read the John Steinbeck classic, “Of Mice and Men” (or at least the Spark Notes). The book’s central theme is this: No matter how carefully a plan is laid, something may still go terribly wrong. That axiom holds true in PR strategy, too. No matter how thorough you are, the unexpected can and will happen. Perhaps you’ve laid out a media strategy that just isn’t moving the needle or you’ve built your plan around a certain spokesperson who leaves the company. Or, perhaps worse, you’re executing your plan against a set budget, but due to circumstances beyond your control, your budget is cut in half. 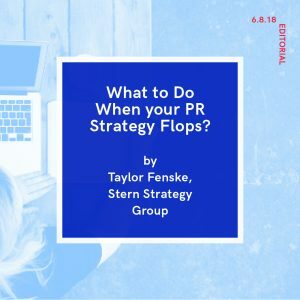 When your PR strategy isn’t working, what do you do? The first step to correcting a problem is to ensure you understand it completely. Start at a high level and ask yourself, “What’s working?” and “What’s decidedly not working?” Use all the tools at your disposal to gather data to inform your thought process. For example, if one of your goals is to drive traffic to your website, use Google Analytics to evaluate how much traffic is coming to your site as a result of your work. I typically jot down all my observations the old-fashioned way – with a pad and pen. (Yes, people still use those things.) Over time, I add to my notes, and read and re-read what I’ve written, looking for different ways to structure the information that may lead to a new idea, tactic or a shift in strategy. Armed with all the data you’ve collected, it’s now time to start from the from the top and define your goals and audiences. Goals can be relatively broad and abstract at this point, but your audience should be meticulously segmented and characterized with psychographic and demographic information. Understanding your audience is the most critical step to influencing attitudes and behaviors. Do not skip it. Do not neglect internal audiences. I’ve seen a PR strategy derailed more times than I care to admit by an executive or internal influencer we neglected to consider. Objectives come next; these represent how you will express your goals. These should be measurable and time constrained so you can prove your new PR strategy is worth every penny. For example: Increase traffic to website by 50 percent by the end of the fiscal year. After you have a broad sense of where you want to go (goals and objectives) and who can get you there (audiences), you can get to the fun stuff: what you’ll actually be doing along the way. Now that you’ve imagined yourself as fabulously wealthy and have come up with some fantastic ideas, it’s time to come back to reality. Actually, reality isn’t far enough. Imagine a scenario in which you must deliver on your objectives with nothing more than a can of lukewarm beans (beans are optional). Or, let’s just say, a quarter of your current budget. Once you’ve allowed objectivity to prevail, you should have a narrow list of the most effective, budget-friendly, reasonable and results-oriented tactics. Taylor Fenske: As supervisor, Taylor converts ideas into results across Stern’s media relations, content marketing, book launch, and conference/speaking outreach competencies. He works with clients – from individual thought leaders to Fortune 500 companies in a spectrum of industries – to design and execute uniquely impactful communications programs tailored to meet their business needs. When he’s not at work, Taylor can be found surfing, snowboarding, or golfing. The foregoing is a guest post from Stern Strategy Group. ⟵Do You Need a Master’s Degree in Public Relations?